Well, I had to find something to do with the leftover Pumpkin Spice Oreos I had from last week's Krispie Pumpkin Spice Oreo Tartlets, so I made some truffles. I love Oreo truffles. They are so easy to make and with all the different Oreos that keep coming out, there is a flavor for everyone's liking. And you can shape the dough in a variety of ways. 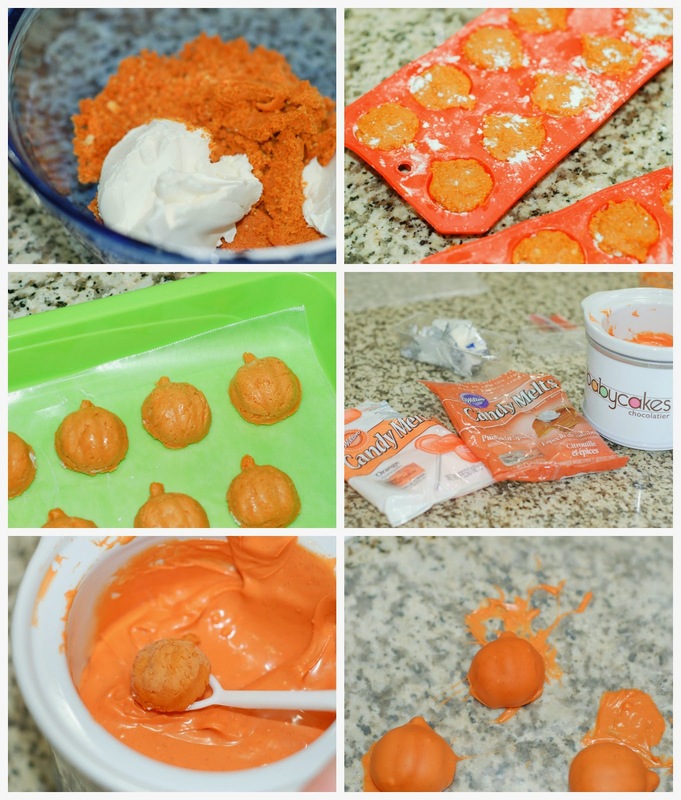 I used a pumpkin ice cube tray to shape these pumpkin truffles. 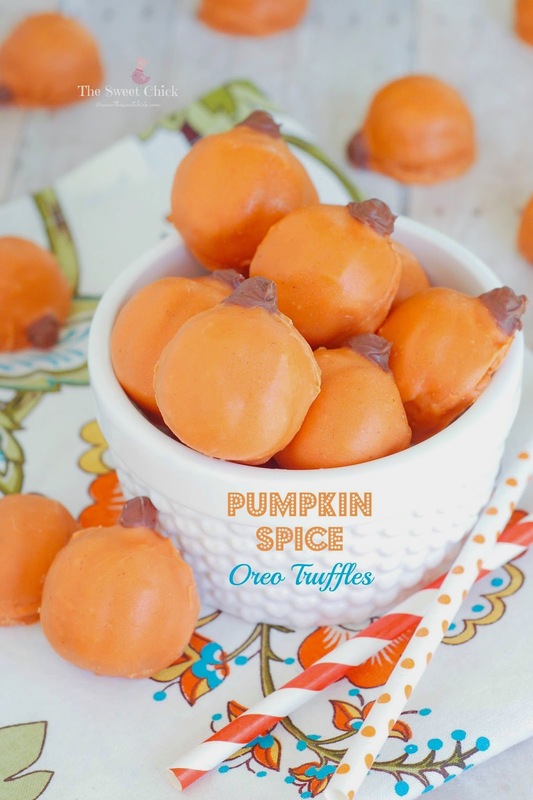 The Pumpkin Spice Oreos and the silicone pumpkin ice cube trays were purchased at Walmart. The Wilton's Pumpkin Spice candy melt is from Michael's. You could just go the easy route and make traditional round truffles, but I thought pumpkins would be cute. I dusted the silicone trays with some powdered sugar to keep the dough from sticking. I pressed the dough into the pumpkin cavities by hand, making sure it was pressed down firmly. Then I popped them into the freezer overnight. The pumpkins came out pretty easy from the molds. What gave me the most problems was the Pumpkin Spice candy melt. I don't know if I got a bad batch or I had water in my container, but the candy wouldn't melt. I tried adding vegetable shortnening and that didn't work. So then I pulled out my Babycakes chocolatier to melt it and added some orange candy melt I had to the batch. Finally, that worked and the candy melt still had plenty of pumpkin spice flavor and came out a brighter shade of orange. So all worked out well. For the stems, I just melted a few bits of chocolate chips in the microwave and painted the chocolate on with one of my cake decorating paint brushes. You could also use a regular clean paint brush. You could also paint on some vines and leaves with some green candy melt like I did for my Maple Pumpkin Rice Krispie Treats. Either way they taste awesome. 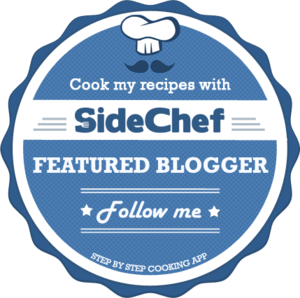 I just love a crunchy outer shell with a creamy, flavorful center. 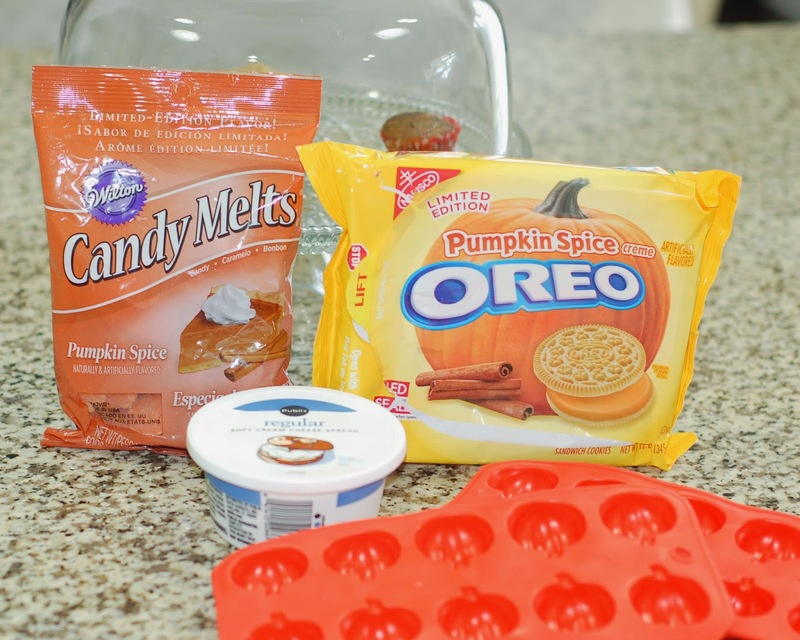 The pumpkin spice in the Oreos and in the candy melt worked really well together. And I think the little pumpkins came out cute. The kids sure did like them. Lightly dust your silicone molds with powdered sugar or flour, removing any excess. Add a small amount of Oreo dough to each cavity pressing down with your fingers until cavity is full. Combine and melt all the candy melt according to the instructions on the package. You may wish to place the melted candy into a warmer like the Babycakes Chocolatier to keep it from hardening up on you. Once the candy melt is ready, remove one tray at a time from the freezer and pop out the pumpkin truffles. With a fork or candy dipping tool, dip the truffles one at a time into candy coating mixture until all covered. Once covered, remove and softly tap until excess candy melt falls off. Then place the truffles on wax paper until the candy melt hardens. You can place the truffles in the fridge to quicken the process. Once the candy melt is set, you can paint on the stems. Simply place the chocolate chips in a microwave safe container and microwave for 20-30 seconds. 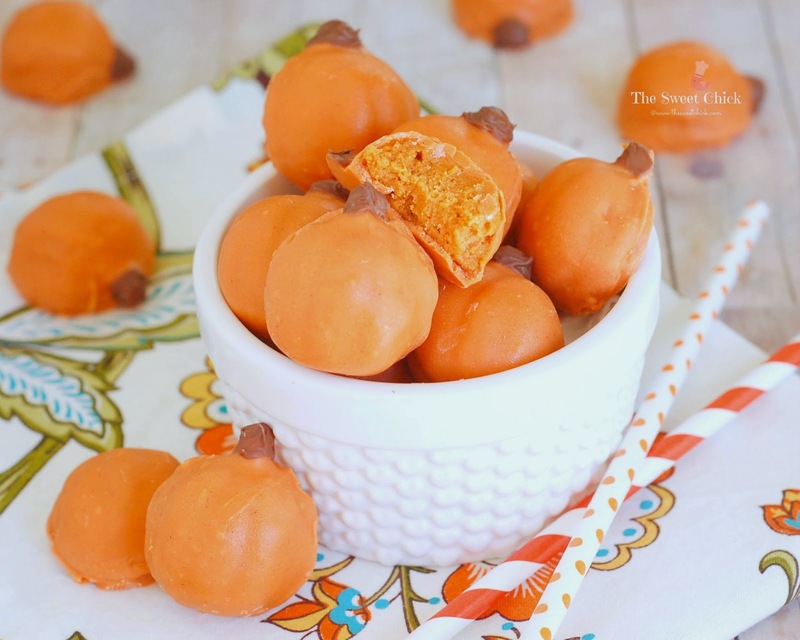 Using a clean paintbrush, paint the melted chocolate onto the stems of the pumpkin truffles and let it set. Keep truffles refrigerated until ready to serve. It is best to have the dough as frozen as possible when dipping, so that it doesn't come apart. If your candy melt does not melt smoothly, you can add 1/2 teaspoon of vegetable shortening at a time to it until it becomes the right consistency for dipping. If the bottoms of the truffles don't get fully covered with candy melt, you can always dip them again.